Welcome to Tasty Tuesday’s Parade of Foods – Bedlam Kitchen Moments. We’ve all had them, haven’t we? Think back to that moment in the kitchen where chaos reigned supreme and that recipe creation you were working on either flopped, failed or became the new dictionary definition of fiasco. My taco casserole catastrophe was understandable because I was a newlywed and hadn’t quite reached my Domestic Diva status yet, but trust me, those bedlam kitchen moments still happen even when one assumes they’ve reached the pinnacle of culinary artistry. So, I’m coming clean with my latest domestic debacle. During triple coupons, I stocked up on some “nearly free” Bisquick mixes. In a rush one morning, I decided to stray from my typical homemade pancakes and take the shortest route with their premium “just add water and egg” recipe. Considering Bisquick has been around for ages and they’ve made a fool proof recipe that even a child could master, I was greatly disturbed when my pancakes continued to stick to the griddle. Not only that, but they wouldn’t keep their shape and the whole process was quite unappetizing. Eyeing these wonders, the kids stared leerily at the breakfast they were expected to consume. My sincerest apologies that I would tarnish your reputation in front of my impressioanble children. I am not too shallow of a woman to admit I was wrong. Now, I’ve admitted my recent kitchen catastrophe, how about you? (Just don’t ask me what happened last week to the amazing Pork Tenderloin that I spent hours preparing for a special dinner. Just a hint…don’t be lazy and tap your Sam’s Club size container of cornstarch directly to the juices surrounding the pork tenderloin, thereby attempting to lessen the washing process of an additional dish from gravy. Because when you attempt to “tap” one tablespoon and make perfect gravy, ahh…twenty tablespoons accidentally unloading onto the tenderloin makes for just a tad stickier consistency than you’d desire. But once again, when I assured my family they could just scrape the sludge off the meat because truly there was something delicious hiding under the “coating,” they went with me on it. Yes, they did. Gotta love those gamers. So share with me. I have a crazy tiring week ahead of me and I know we could all use some GREAT chuckles before we start browsing our Tasty Tuesday recipes. What’s one of your crazy kitchen moments? I love to read your posts! It always makes me smile! My husband also eats anything and NEVER complains, sometimes when he eats really slowly I just know it’s not good. This is a great post, I am so linking up tomorrow. As soon as I can think of the funniest recipe oops. By the way, I started making homemade pancakes and waffles a few years ago. My children will not eat any other type now. They say “they just don’t taste right”! Amazing what whole ingredients will do to your taste buds. One time I made a big batch of mini loaves of poppyseed bread to give as holiday gifts–they looked beautiful when they came out of the oven–with nicely rounded tops. I packaged them up, and then nibbled on an extra little loaf–and had to spit it out! It was really salty tasting…I’m still not sure what I did–maybe added too much baking soda–but they tasted horrible! That is so stinkin’ funny! I’ve had a few myself but the one that tops all of them is actually when my sister made cookies and added a cup of salt instead of a teaspoon! Good thing we tasted the dough before baking all of the cookies! Tried to make some fried rice the other night. My timing was off and the rest of the meal wasn’t ready yet so I tossed in only a wee 1/4 cup of water into the rice to help it “last” not scorch. Well. It lasted right into a mushy concoction of what used to resemble rice grains, now looking like rice clumps. My trooper family consumed it without complaint, saying that the taste was what mattered. I begged to differ but I’m thankful they’re appreciative of my efforts. These stories are funny…maybe not at the time, but very funny now. Until last summer, everything I put on the grill turned out to be a disaster:burned and dried out. I love to cook, but I was not great at grilling. I finally did some reading up on it and now have improved so much that my family will now eat what I take off the grill. I am TOTALLY laughing because this past Saturday morning the kids wanted waffles. I had Bisquick and no eggs! So I Googled using Bisquick without eggs and came across a recipe where you could add some applesauce and 1 TB of extra oil. Ummm . . . TERRIBLE. Too funny! I forgot the butter in my cinnamon roll dough. My kids made small balls of the rubbery dough… and yes, they do bounce off the floor! I was trying to just mix dough in my breadmaker and forgot to put it on the dough setting. So it baked 🙁 On the bright side, my family is like yours and they’re so good at taking a flop and being okay with it! My hubby sliced it and we used it as breadsticks anyway;) I LOVE that my family is not picky! 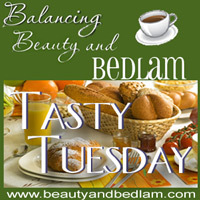 Happy to be apart of the Tasty Tuesday linky party!!! I remember once when my sister dumped a bag of powdered sugar into the flour bin. (it’s all white after all!) We made pizza with it! It was awful! I haven’t had too many disasters in the kitchen because I haven’t been cooking that long, but so far the two most annoying things I made were Shepherd’s Pie (from scratch with no leftovers) and homemade mac and cheese. The Shepherd’s Pie was a pain because I had so many pans on the stove at once that had to be watched constantly and I had planned on making a somewhat simple meal. It turned out fine, it was just frustrating. My boyfriend and I thought we would guess at the measurements for the ingredients for homemade mac and cheese. We knew we needed a roux to use as a base for the creamy cheese sauce, but instead of something like a tablespoon of butter and flour, we used a cup of each which made the mac and cheese taste like chalky flour – kind of like your pancakes. We know better now! That’s funny, because on Sunday, I baked white layer cakes, and couldn’t figure out why they weren’t rising. I had forgotten to add in the egg whites. You are supposed to beat them until they form stiff peaks, then fold them in. Yup, there they sat on the counter. Not beaten, and not folded in. There are days when I feel like a domestic diva. Then there are days when I don’t. And lately I’ve had a few don’ts! I tried making my own hamburger buns because I just didn’t want to run to the store for them. Well, they tasted great but looked HIDEOUS. I changed the recipe without having tried it as is first. Oh well. My homemade flour tortillas didn’t go quite as well as they’ve done in the past. Again, tasted great but looked funny. On the upside, I’ve been watching The French Chef episodes with Julia Child and I successfully made omelets like she does. Those have got to be the easiest and fastest things to cook! Hi, Jen, I’m sharing a yummy strawberry cake today. Starts with a white cake mix, so it’s quick and easy and tastes homemade. With strawberries coming in, great for summer! My most recent cooking catastrophe would be the pumpkin bread I made for breakfast a few months ago. Everybody loves it and was looking forward to it … until they took the first bite. I had forgotten the sugar. I’ve done the cornstarch thing. I can’t think of anything specific but I am known for missing ingredients. My biggest problem, is when I am doubling a recipe. I will start off doubling everything and then by the time I get to the bottom of the recipe, I’ve forgotten to double. Quite annoying. Love your stories! 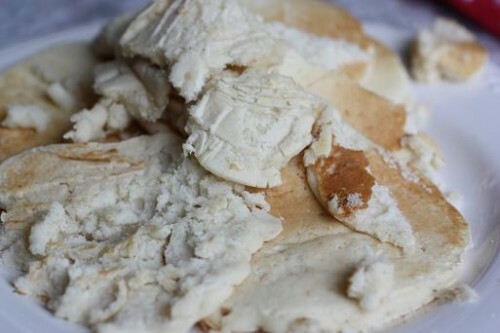 I wish lack of eggs were the reason for my flopped pancakes yesterday. But, it was just me! Thanks for sharing the story. Now I don’t feel so alone in the bad pancake maker world. So many fiascos, so little time. Last summer while making turkey burgers, I made a big one. Since turkey is a little….bland, I usually spice it up with chili powder and seasoned salt. After the burgers were done and the kids were eating, they all started coughing and drinking, unable to talk, more coughing and drinking. Finally, when they had regained their ability to speak, they complained that the burgers were hot. I teased them at their inability to eat spicy food before I took a bite. Oh my gracious! I used Cayenne for sprinkling instead of chili powder so I had to eat them all by myself and fix the kids something else. OOPS! @Tasha, Try this: put the pasta in the water, stir it around really well, then turn down the heat a smidge. Do it right away if you’re using an electric stove; if it’s gas, you can wait until the water starts getting bubbles again – but NOT boiling yet. Another thing you can do is put your wooden spoon across the top of the pot. Somehow it keeps the water just under the edge of the pot. But you’ll still have to watch it a little – pasta’s starchy. Maybe, also, you’re using too small a pot? Use a bigger pot with the water well under the top edge (1 1/2 inches), and there will be more room to boil. I made my favorite no-bake cookie recipe the other day (which I make several times a month) and they totally fell apart into crumbs as they cooled! I wouldn’t even let the kids (5, 3, 1) eat them in the house because they were so messy to eat! It’s not like it was a new recipe! This past Sunday I made a big dinner for Mother’s Day. Mom requested chicken parm, pasta, salad, and strawberry shortcake. I, on the other hand, decided to make the sauce from scratch, make from-scratch breadsticks, and two side dishes. Needless to say I was stressed. So stressed, in fact, that my mom actually cried because she felt guilty. That’s what I get for overreaching, I guess! Everything turned out fine…just an hour later than I wanted it to! This past Sunday I was going to put dinner in the oven and have it done after we got home from church. But as the service was ending and I was thinking about how great it would be to come home to food cooking I realized I had forgotten to put it in the oven. Oh well. We had french toast instead. Two things come to mind: once, when we had a new pastor (20 years ago & counting! ), we had them over to lunch after church. I put a big brisket on the grill – offset the way my dad does them, so it would roast & not be grilled. Of course, it cooked too hot & the bottom was a little….. hard. Pastor’s daughter (about 8 yrs. old) came to her mom & asked her to cut off the bottom. Mom said it was fine & the kid cried out, “But it has SKIN on it!” Proud moment. @Jens, is this one of those “takes one to know one” moments???? HA! can’t believe you thought to take a picture of the pancake debacle! LOVE IT! My most recent flop was a pan of cookies I tried sustituting flax seed meal for eggs in. NEVER AGAIN! they were burned to a crisp and still liquid (not in a good way) on the inside..uggh. The pigs got those. Heard they gobbled them right down – at least they didn’t *totally* go to waste..thanks for the tasty tuesday link up! I was making hot wings and heated the oil too hot. It caught on fire. I asked (yelled) for my husband to help. He was playing video games and said “Just a minute. ” I said , “There is a fire!” and he stared to argue with me that it couldn’t be that bad! Finally he came in to find the pot shooting sky high flames. We couldn’t remember what you are supposed to put on a grease fire so we threw flour on it. (Baking soda, by the way.) When that made it worse, he tried to smother the flames with a towel. (??!??!) That, of course, caught on fire. He then grabbed the rag and threw it into the sink. The flaming rag caught the curtains on fire. By this time, we thought the house was going down. My sister (who was there for me to cook her her birthday dinner) grabbed my baby and ran to the next door neighbors. We called 911 and got out. The next door neighbor ran over with the correct baking soda and doused the flames. Then 5 full sized fire trucks blared into the neighborhood. My husband had to block the door as they tried to run in with the hoses, poised to blast. He explained the fire was out. They opened the windows and put a huge fan at the front door to blow the smoke fumes out. We then went to eat at the Olive Garden, especially since my sister’s completely decorated cake sat on the counter, covered in ashes. It took us forever to wipe the greasy ash of of the kitchen. I really appreciate the contributors who put the recipe title under the photo, instead of their name or blog name. I eat a whole grain vegetarian diet and this helps me quickly sort through all the entries for the few that fit our diet. This week I shared a recipe for giving back! I’m working with Glad to help raise funds for Cookies for Cancer. I had an awesome recipe for some Latte Cookies. Well the recipe called for instant coffee. Not knowing there was a difference, I put regular coffee in them. Needless to say the cookies were a little gritty. Lol! 15 years ago or so, as a student whose parents were overseas, I invited my fellow grad students (all non-Americans) over for Thanksgiving. Everyone brought something and I roasted the turkey and made Martha Stewartesque pumpkin pies with pate brisee and everything. Except I forgot to put sugar in my pie filling. I served everyone else and myself last. I took one bite and literally clawed it out of my mouth. I looked up at my other American friend, who mouthed silently in horror, “NO SUGAR”. What’s worse is that all the others had eaten at least half of theirs. They’d never had pumpkin before and thought that was just how we did it in the USA. Uggh. Last year for my sons 3rd birthday and I used what I thought was a sheet pan but was actually a jelly roll pan to bake the from scratch birthday cake. It looked and smelled delicious–but it was tough and terrible. The kids just ate the icing and I had no idea until I had fed it to all of our extended family and I was eating leftovers that night! It was decorated beautifully with a fireman theme so I think I got away with a little more due to the delicious frosting and decorating! I tried to make a new crock pot chili & cornbread recipe a while back where you make the chili then towards the end of the cooking time pour the cornbread batter on top and it cooks in the crock pot. The picture in the cookbook looked great but when I poured the batter in it just sunk into the chili instead of staying on top. It mostly cooked within the chili but was more like corn mush. My husband said it was fine and even ate the leftovers but I didn’t want anything else to do with it. Thanks for the linky! My family & I were heading to a friends house for dinner & I decided I would bring Apple Crisp… I’ve made it a thousand times…. So I decided that I didn’t need a recipe…. I’d ‘dump cook’…. (My usual recipe is from “Whole Foods For the Whole Family” by La Leche League)… anyhow I thought caramel would be yummy to add… Ha…. The caramel was hard as a rock & I had added too much salt!! Thank goodness they’re good friends – we laughed & laughed over the whole mess…. @Sue, Those are good friends…and guess what? That Whole Foods book was given to me by my sis in love as a wedding present. One of my very first cook books ever. I need to go dig it out, it’s been ages. Blame it on the crap recipes, that’s what I like to do! I just hate having to waste so much food after you’ve put so much effort into it. Ah, well, we learn!